'Whitone' (Walter Welch, R. 1953). Seedling #J-538. DB, 8.5" (22 cm). Early bloom. Standards pure white; falls pale ivory; white beards. 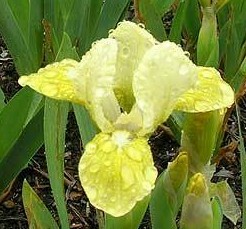 'Elegance' X seedling #G-522: (('Fiancée' x 'Fairy') x self). Welch 1953.